In just a few short weeks Fairtrade Label South Africa (FLSA) will be celebrating our very first Fairtrade Week in South Africa, a campaign aimed at raising awareness about Fairtrade among the local public. Fairtrade Weeks slogan, ‘Taste the Change’, encourages South Africans to learn about the incredible potential of fair trading, and the significance it plays in improving lives in farming communities and in offering consumers the possibility of an ethical choice. “I am confident in the ethical consciousness of South African consumers. I have no doubt that they will be excited in tasting the positive changes brought about by Fairtrade in our country simply by choosing Fairtrade certified products in their everyday shopping.” says FLSA Executive Director Boudewijn Goossens. Goossens continues, “Fairtrade Week is going to be a major milestone for increasing Fairtrade brand awareness in South Africa”. Fairtrade Week, the biggest event on FLSA’s annual calendar, will include a host of activities. The campaign will be kicked off in high spirits as Kraft Foods’ Fairtrade Cadbury Dairy Milk bars will be introduced into retail stores with an official product launch at Pick n Pay’s flagship store on William Nicol on 15 November 2011. Throughout the course of Fairtrade Week FLSA’s Executive Director Boudewijn Goossens and Fairtrade producers will be featured and interviewed in a range of newspapers, on various radio stations and other media platforms around the country. The Fairtrade Week festivities will be concluded in style with an intimate, trendy Fairtrade cocktail at the soon to be opened Bean There coffee Roastery in Cape Town on 18 November 2011. Media representatives will be invited to meet Fairtrade producers while getting a taste of Bosman Family Vineyards Fairtrade wine, Bean There Fairtrade coffee and the new Cadbury Dairy Milk Fairtrade chocolate. • The account of Kraft Foods SA showing how fair trading can be a benchmark for the way to do business in Africa. Everyone can be involved in Fairtrade Week and help us spread the word by simply liking our Facebook Page and following us on Twitter. By doing so you’ll also stand a chance to win a grand Fairtrade hamper: each containing lip-smacking Fairtrade wine, yummy Fairtrade chocolate and de-li-cious Fairtrade coffee. • Fairtrade is the most trusted ethical certification system in the world. Fairtrade standards aim to tackle poverty and empower farming communities by ensuring better working and living conditions and providing them with additional income, the Fairtrade Premium, to invest in education, training and improvement of local infrastructure. In addition, Fairtrade certified farms have to implement environmentally friendly practices in order to ensure production is sustainable. There are currently over 230 Fairtrade certified producer organisations in Africa, over 60 of them in South Africa. • Fairtrade Label South Africa (FLSA) is the local marketing organisation for Fairtrade and aims to alleviate rural poverty and to empower small-scale farmers and disadvantaged workers primarily in Africa by creating market opportunities for and increasing sales of Fairtrade labelled products in South Africa. 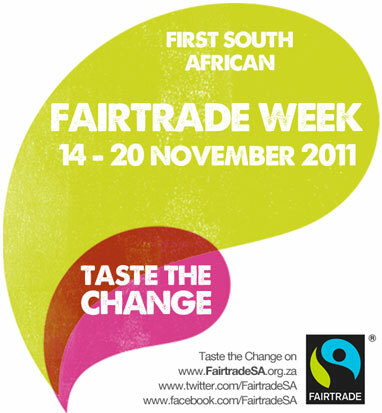 • Fairtrade sales in South Africa reached a staggering R18,4 million in 2010, a three-fold increase from the R5,7 in 2009.